In the September/October 2012 issue, the Imaging Essentials column discussed carpus and manus radiography. 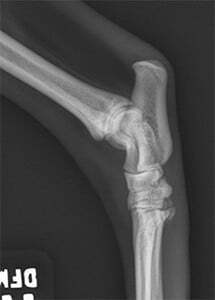 Similar to radiographs of those structures, radiographs of the tarsus and pes are used to evaluate traumatic injuries and swelling or lameness. Standard evaluation of the tarsus and pes includes mediolateral and dorsoplantar projections. The additional projections described aid in diagnosis of specific disease conditions or evaluation of specific anatomic areas. Stress views are described so that ligamentous and joint capsular stability can be assessed. 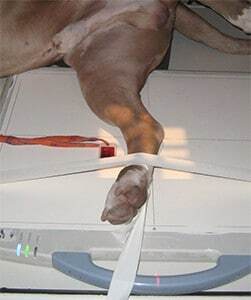 For the mediolateral projection, the dog or cat is positioned on the table in lateral recumbency, with the affected thoracic limb positioned against the table or imaging cassette/detector. Figure 1. 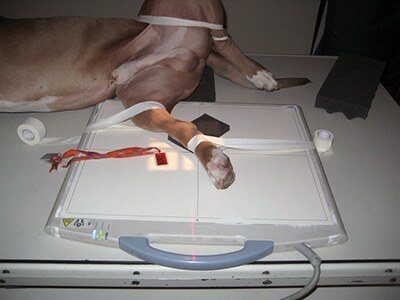 Dog positioned for mediolateral image of the tarsus (A) and corresponding radiograph (B). Mediolateral positioning for the pes (C) and phalanges (D) and corresponding radiographs (E and F, respectively). The affected pelvic limb is pulled distally in a neutral position (perpendicular to the body; not pulled cranially or caudially) and taped in that position. 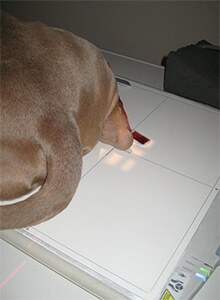 A small sponge may need to be placed under the stifle to keep the limb level with the detector/cassette. 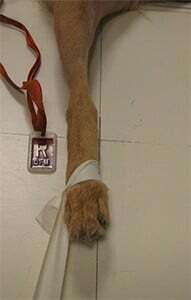 The unaffected limb is taped and pulled caudally to avoid superimposition between the 2 pelvic limbs through the level of the proximal femur, in case mediolateral images of the crus or stifle also need to be taken. 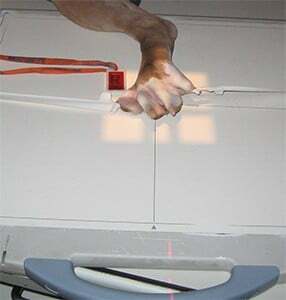 Alternatively, the unaffected limb may be abducted away from midline and the table; then secured to the table with tape in the same fashion as when imaging the stifle or femur (unaffected pelvic limb is taped to the back of the table as shown in Figure 4A). In some patients with severe degenerative joint disease, the unaffected limb can be pulled cranially or caudally and secured with tape, keeping it out of the collimated image. Tarsus: Palpate the medial malleolus of the tibia and center the collimated beam just distal to it. Collimate so the field of view (FOV) includes the proximal third of the metatarsal bones and distal third of the tibia and fibula. Pes: Collimate so the FOV is centered on the metatarsal bones and includes the digits (toenails included), extending proximally to the tarsocrural joint (medial malleolus). Phalanges: The mediolateral projection of the phalanges requires spreading the digits to avoid superimposition of the sesamoids and metatarsophalangeal joints. This can be accomplished by placing a cotton ball between each digit. Alternatively, the digits can be separated by taping the nail of digit II and digit V with a 12-inch length of ½-inch adhesive tape; then pulling digit II dorsally and digit V in a plantar direction, taping them to the detector/cassette or table. If the digit lacks a nail, tape around the entire digit, recognizing there will be tape artifact superimposed over the digit. The radiopaque marker is positioned next to digit V to denote lateral. For the dorsoplantar projection, the area of interest is imaged in a dorsal to plantar direction, which positions the affected limb against the cassette/detector or table and reduces magnification and geometric distortion. Figure 2. 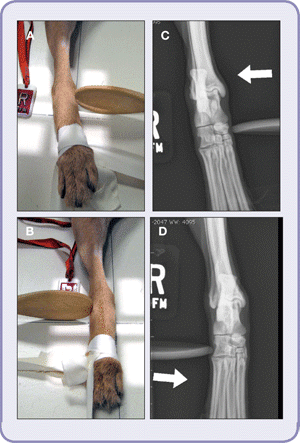 Dog positioned for dorsoplantar images of the tarsus (A) and corresponding radiograph (B). Dorsoplantar positioning for the pes (C) and phalanges (D) and corresponding radiographic images (E and F, respectively). 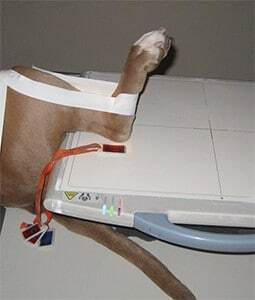 The dog or cat is positioned in dorsal recumbency in a V-trough, with the pelvis placed outside the trough directly on the table (as if you were positioning an extended leg ventrodorsal pelvis radiograph). 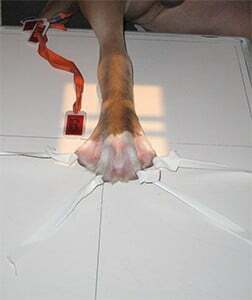 Both pelvic limbs are pulled caudally and taped to the table. A band of tape is placed around the stifle joints, pulling them medially in order to straighten the tarsus, pes, and phalanges. Place the tarsus, pes, or distal extremity in the center of the collimated FOV. A sponge may need to be placed under the cassette/detector to elevate it from the table, placing the cassette/detector as close to the tarsus, pes, and phalanges as possible. Tarsus: Palpate the distal tibia at the tarsocrural joint and place the center of the collimated beam at the level of the proximal intertarsal tarsal joint. Avoid centering the beam on the calcaneus as this places the beam proximal to the joint. Collimate so the FOV includes the proximal third of the metatarsal bones and distal third of the tibia and fibula (crus). Pes: Collimate so the FOV is centered in the middle of the metatarsal bones and includes the digits (toenails included), extending proximally to the talocrural joint. Phalanges: The dorsoplantar projection of the phalanges requires spreading the digits; follow the instructions for doing so under Mediolateral Projection. These ancillary radiographic projections allow for application of stress to the tarsus joint in an effort to identify joint space widening, which is encountered when damage to the soft-tissue supporting structures of the joint has taken place. Figure 3. 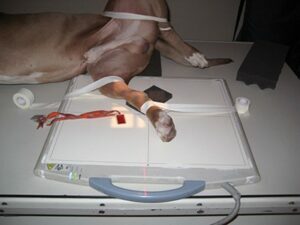 Dog positioned for mediolateral flexed image of the tarsus (A) and corresponding radiograph (B). Place the patient in the mediolateral position for the affected pelvic limb. Bend the metatarsal bones toward the cranial aspect of the tibia and fibula; use tape to secure this position. Figure-8 taping can be used around the metatarsal bones distally and the distal tibia and fibula proximally. 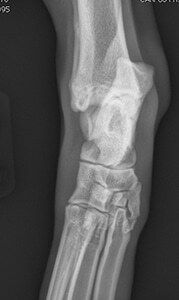 Center the FOV at the talocrural joint; collimation should include the proximal metatarsal bones, tarsus, and distal tibia and fibula. Place the patient in the mediolateral position for the affected limb. 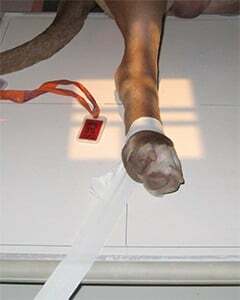 Apply adhesive tape around the tibia and fibula, pull the tape cranially, and anchor to the imaging cassette/detector or table. Apply another strip of tape around the metatarsal bones, pulling caudally, and anchor the tape to the cassette/detector or table. This taping results in hyperextension of the talocrural, intertarsal, and tarsometatarsal joints. 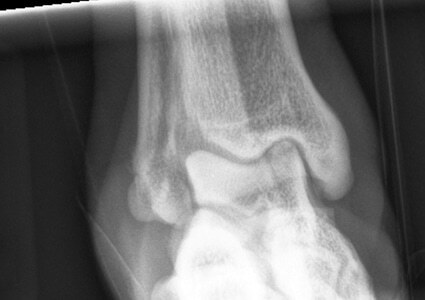 Center the FOV on the tarsal joint; collimation should include the proximal metatarsal bones and distal tibia and fibula. Figure 5. Positioning from Figure 2 shown with application of spoon for dorsoplantar medial (A) and lateral (B) stress images along with corresponding radiographs (C and D, respectively). Stress views require additional personnel who can apply necessary pressure to the tarsal joints while the exposure is taken. Those obtaining these images should follow appropriate radiation safety practices, including wearing radiation monitoring badges, leaded aprons, gloves, and thyroid shields. A wooden cooking spoon is used to apply medial or lateral stress to the tarsus, identifying any collateral damage to the joint. Begin with the patient in position for a dorsoplantar projection. Place adhesive tape around the distal metatarsal bones and pull distally, anchoring the tape to the edge of the table. 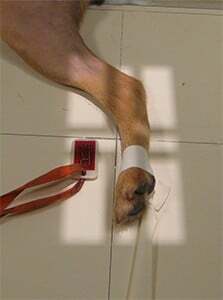 Place a second piece of tape around the proximal metatarsal bones and pull medially, attaching the tape to the edge of the cassette/detector or table to anchor the pelvic limb. The assistant should hold the handle of the spoon outside the primary x-ray beam while placing the edge of the spoon along the medial aspect of the tarsus at the level of the proximal intertarsal joint. The edge of the spoon is then pushed toward the lateral side gently; the exposure is taken while this pressure (stress) is applied. The same taping method is used as for the lateral projection, except the second piece of tape is pulled laterally in order to provide an anchor for the pelvic limb while pressure is applied using the spoon. Place the edge of the spoon along the lateral aspect of the tarsus at the level of the proximal intertarsal joint and apply gentle pressure in a lateral to medial direction. Open the collimation up in the proximal to distal direction to obtain the entire tarsus while pressure is applied in case there is collateral damage. Collateral ligament injury or disruption will give an appearance of the tarsal bones being separated along the lateral and/or medial aspects of the joint involved. Figure 6. 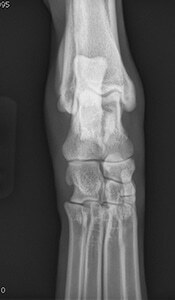 Dog positioned for dorsolateral to plantaromedial oblique (A) and dorsomedial to plantarolateral oblique (B) images and corresponding radiographs (C and D, respectively). 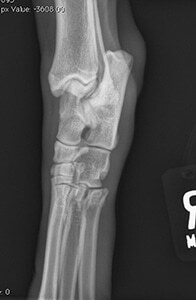 Note the positioning of the radiographic marker along the lateral aspect of the limb. In these oblique projections, the radiopaque identification marker remains along the lateral aspect of the pelvic limb. Place the patient in the dorsoplantar radiographic projection position to begin. Place the tarsus in a straight dorsoplantar orientation; then rotate the crus, tarsus, and pes toward (supinate) midline approximately 35 degrees. Collimation remains the same as for the dorsoplantar projection. The resulting image includes the same anatomy as the dorsoplantar image, except that the dorsomedial and plantarolateral structures (bone and joint surfaces) are highlighted. Place the tarsus in a routine dorsoplantar position; then rotate the crus, tarsus, and pes outward (pronate) from midline approximately 35 degrees, which rotates the tarsus, highlighting the dorsolateral and plantaromedial surfaces of the tarsal bones and joints. 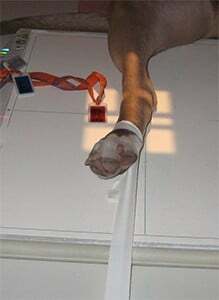 The resulting image includes the same anatomy as the dorsoplantar image: the calcaneus is projected laterally and the fibula is superimposed over the tibia. Figure 7. 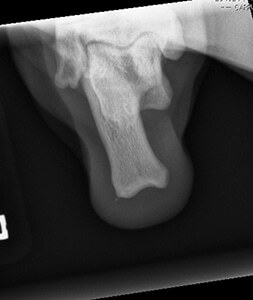 Dog positioned for dorsoplantar flexed skyline image of the trochlear ridges of the talus (A) and corresponding radiograph (B). Skyline projections highlight a different aspect of the subchondral bone surface—a more dorsal subchondral bone surface compared with a more plantar surface on routine extended dorsoplantar images—of the talus’ trochlear ridges at the talocrural joint. This view helps evaluate the trochlear ridges and medial malleolus of the tibia for osteochondritis dissecans lesions in the dog. Place the patient in the position for routine dorsoplantar radiographic projections. Put a large sponge under the cassette/detector, which elevates it off the table, placing the affected limb against the imaging detector. 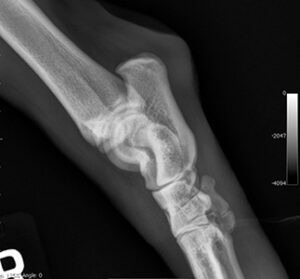 Flex the talocrural joint, pointing the foot (pes) straight up at the x-ray tube. If the joint cannot be flexed to a 90-degree position and exactly perpendicular with the table, an angle of 5 to 10 degrees off the angle with the primary x-ray beam is acceptable. Collimate the FOV just to the distal third of the tibia and fibula, including the talocrural joint and extending distally to the level of the toenails of the digits. The resulting image will highlight the subchondral bone of the distal tibia and trochlear ridges of the talus without superimposition of the calcaneus (as seen in dorsoplantar projections). The lateral and medial malleolus can also be evaluated. Figure 8. 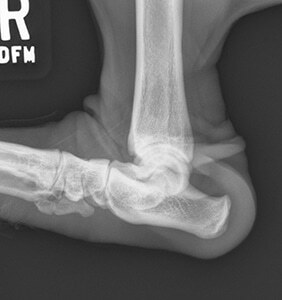 Dog positioned for plantaroproximal to plantarodistal oblique skyline image of the calcaneus (A) and corresponding radiograph (B). Place the patient in ventral recumbency. Place both pelvic limbs forward and underneath the pelvis in a sphinx-like position. This positioning helps keep the calcaneus straight relative to the axis of the pelvic limb. 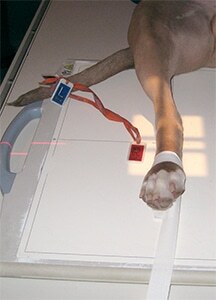 Place the affected limb on the cassette/detector or table. This limb needs to be in a caudal position to allow the calcaneus to extend beyond the ischium in order to avoid superimposition. Collimate the FOV to include the calcaneus but avoid including the distal tibia/fibula (which would be superimposed over the metatarsus). The resulting image will highlight the calcaneus without superimposition of other tarsal anatomy. Have you asked yourself, “Should I make the move to digital radiography?” It’s a question that most practices have considered by now. Fellow practitioners with digital radiography (DR) and digital equipment manufacturers will tell you the benefits are substantial. Better diagnostic capabilities: First and foremost, digital images, and the ability to enhance and adjust images while viewing, create better diagnostic views, improve accuracy, and can enhance the overall quality of medicine. Access to specialists: Because digital images are easily portable, specialist support becomes more accessible through email and virtual consultation. Increased efficiency: Imaging with digital equipment is light years faster than traditional film processing. And because digital images can be manipulated, there is no need to constantly retake views to attain the optimal image. Staff savings: With quicker processing times, increased speed, and reduction in the number of images required, the veterinary team spends more time working with other patients. Reduced supply costs: DR machines do not require the inventory of multiple film sizes, developer fluids, or processing maintenance. Increased volume: Many adopters of digital imaging will say that the increased efficiency and ease of use of DR has led to increased volume in the number of imaging studies they perform. Client value: Digital images are easier to share with clients and can be viewed in examination rooms, on tablets, and even on smart phones. As clients become more integrated into the care of their animals, the perceived value of this service increases. Increased revenue: With an improvement in client value, many practices can increase their prices for radiology studies, which increases associated revenue from patient diagnostics. This decision is not just for large practices. As DR technology advances, many new options are becoming available for all sizes of veterinary practices. However, implementing DR requires significant investment and commitment from the entire practice team, who must consider all of the medical, financial, operational, and staff training requirements to make the transition a successful one. Is the technique adequate (appropriate exposure and development factors)? Specifically, have soft tissues been preserved on the image or has the detector been saturated resulting in loss of soft tissue visualization? Is the correct anatomy present within the image? Is the positioning correct for the radiographic projection? The calcaneus should not look foreshortened. 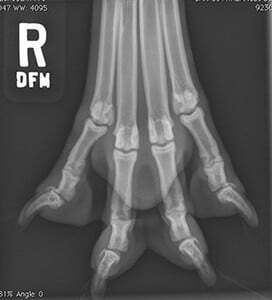 The proximal and distal tarsal bones should be mostly superimposed, with each row distinct. The calcaneus on the lateral side should be superimposed over the talus, lateral malleolus, and fibula. The metatarsals and phalanges should be superimposed. The tarsus, distally to the phalanges (including the toenails), should be included. The tarsus should have the same appearance as when the image is centered on the tarsus. The phalanges should be spread apart to avoid superimposition. For the mediolateral and dorsoplantar projection of the phalanges, each phalanx should be separated to allow visualization of each joint. Danielle Mauragis, CVT, is a radiology technician at University of Florida College of Veterinary Medicine. 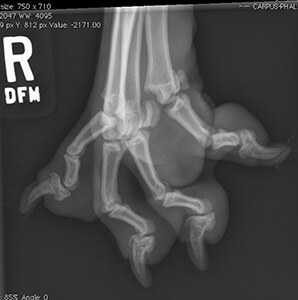 She teaches veterinary students all aspects of the physics of diagnostic imaging, quality control of radiographs, positioning of small and large animals, and radiation safety. Ms. Mauragis coauthored the Handbook of Radiographic Positioning for Veterinary Technicians (2009) and was the recipient of the Florida Veterinary Medical Association’s 2011 Certified Veterinary Technician of the Year Award. This award recognizes an individual for the many outstanding contributions that person has made to the overall success of a veterinary practice operated or staffed by an FVMA member veterinarian.